Thomas Manton (1620-1677) was baptized March 31, 1620 at Lydeard St Lawrence, Somerset, a remote southwestern portion of England. His grammar school education was possibly at Blundell’s School, in Tiverton, Devon. His formal education came at Wadham College, University of Oxford, and he eventually graduated BA in 1639 from Hart Hall. Joseph Hall, bishop of Norwich, ordained him deacon the following year: he never took priest’s orders, holding that he was properly ordained to the ministerial office. He was then appointed town lecturer of Sowton in Devon, where he served from 1640–1643, and at Colyton, Devon, from 1643-1645. In July 1645 he moved from the rural western counties to the London area, as Colonel Alexander Popham, the patron of St. Mary’s parish, brought him east to the tiny town of Stoke Newington, in Middlesex county, outside London proper. Here he began his major mid-week lectures, first on Isaiah 53 (mid-1640s), then on James (end of 1640s), and finally on Jude (late 1640s–early 1650s). While at Stoke Newington he was invited to preach before Parliament for the first of at least six occasions on June 30, 1647, which was a fast day for Parliament. 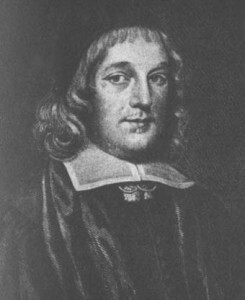 His sermon was based on Zechariah 14:9 and entitled, “Meat out of the Eater; or, Hopes of Unity in and by Divided and Distracted Times.” Exactly one year later, on June 30, 1648, he preached another fast sermon on Revelation 3:20, “England’s Spiritual Languishing; with the Causes and the Cure.” He also participated in the Westminster Assembly as one of three clerks, was later appointed to write a preface to the second edition of the Westminster Confession in 1658, and served Oliver Cromwell as a chaplain and a trier (an overseeing body that examined men for the ministry). A memoir by Rev. Dr. Harris. A Practical Exposition of the Lord’s Prayer. On Christ’s Temptation and Transfiguration. On Redemption by Christ and His Eternal Existence. An Estimate of Manton (by J.C. Ryle). Several Discourses Tending to Promote Peace and Holiness. Twenty Sermons on Important Passages of Scripture. Farewell Sermon. Hebrews 12:1. The last sermon he preached after the Great Ejection in 1662. The Saint’s Triumph over Death. The Blessed Estate of them that Die in the Lord. Eighteen Sermons on the Description, Rise, Growth, and Fall of Antichrist. A Practical Exposition upon the Fifty-Third Chapter of Isaiah. This volume contains: A Practical Commentary, or an Exposition, with notes, on the Epistle of James. A Practical Commentary, or an Exposition, with notes, on the Epistle of Jude. Meat out of the Eater. Zechariah 14:9. Preached to the House of Commons June 30, 1647. England’s Spiritual Languishing, its Causes and Cure. Revelation 3:2. Preached to the House of Commons June 28, 1648. How we may Cure Distractions in Holy Duties. Matthew 15:7-8. How Ought we to Improve our Baptism? Acts 2:38. Man’s Impotency to Help himself out of his Misery. Romans 5:6. The Scripture sufficient without Unwritten Traditions. 2 Thessalonians 2:15. This volume contains 52 sermons on Psalm 119:1-46. This volume contains 51 sermons on Psalm 119:47-98. This volume contains 54 sermons on Psalm 119:98-141. Thirty-two sermons on Psalm 119:142-176. Sixteen sermons on Matthew 25:1-29. Eleven sermons on Matthew 25:30-46. Thirty-two sermons on John 17:1-18. Thirteen sermons on John 17:19-26. Twenty four sermons on Romans 6:1-23. Eleven Sermons on Romans 8:1-9. Thirty-six sermons on Romans 8:9-39. Eight sermons on 2 Corinthians 5:1-6. Thirty-one sermons on 2 Corinthians 5:6-21. Seventeen sermons on Hebrews 11:1-4. This volume contains 24 sermons on Hebrews 11:4-28. Three sermons on Hebrews 11:29-31. A Treatise of the Life of Faith. In two parts, prayer and hearing the Word. A fast sermon on Isaiah 43:22. A fast sermon on Malachi 3:7. Two preparative sermon for Receiving the Sacrament: 2 Chronicles 30:18-20 and Song of Solomon 2:3. A sermon on Luke 17:32. A sermon on John 3:33. Two sermons on Micah 6:8. A sermon preached before Parliament. Zechariah 14:6-7. A sacrament sermon. Song of Solomon 1:12. A sermon on Micah 7:18. A sermon on John 13:8. A sermon preached before the sons of the clergy. Psalm 102:28. A sacrament sermon on Luke 22:20. A sermon on the ends of the sacrament. Matthew 11:7-9. A sermon on Matthew 22:11-13. A sermon preached before Parliament. Amos 4:12. Twenty-two sermons on Titus 2:11-14. Five sermons on Hebrews 6:18. Two sermons on John 14:1. Two sermons on Luke 12:48. A sermon on Deuteronomy 32:51. A sermon on Acts 17:30-31. Eight sermons on Mark 10:17-27. Five sermons on 2 Thessalonians 1:3. A sermon on Matthew 8:5-10. A sermon on Matthew 15:21-28. A sermon on John 8:56. A sermon on Romans 4:18-21. Three sermons on Mark 3:5. Two sermons on Exodus 4:21. A sermon on Genesis 3:15. Ten sermons on Genesis 24:63. Two sermons on Luke 16:30-31. A sermon on Hebrews 13:20-21. A sermon preached on a Public Day of Thanksgiving. 2 Chronicles 32:25. A sermon on Luke 22:31-32. A sermon on Hebrews 1:9. Two sermons on Acts 24:14-16. A sermon on Zechariah 14:20-21. A sermon on John 3:14-15. Two sermons on John 3:14-15. Two sermons on 1 Thessalonians 5:16. A sermon on 1 Thessalonians 5:17. A sermon on Mark 2:17. A sermon on Psalm 8:2. A sermon on Joshua 6:26. A sermon on Micah 6:5. A sermon on Isaiah 50:10. A sermon on 2 Samuel 7:27. A sermon on Psalm 50:5. A sermon on Psalm 127:3. A sermon on Philippians 4:8. A sermon on Luke 19:14. A sermon on Luke 2:52. A sermon on Philippians 2:7. A sermon on 1 Corinthians 8:3. A sermon on Psalm 84:10. Two sermons on Luke 19:10. Two sermons on Psalm 90:1. A sermon on 1 Timothy 6:9. A sermon on 1 Peter 1:12. A sermon on Galatians 5:5. A sermon on 2 Peter 3:9. A sermon on Romans 10:5-9. A sermon on Romans 10:10. A sermon on 1 Corinthians 8:6. A sermon on 1 Corinthians 4:18. A sermon on Luke 16:25. A sermon on 1 Corinthians 13:4-8. A sermon on Psalm 84:7. A sermon on 1 Corinthians 11:26. A sermon on Malachi 3:17. A sermon on 2 Timothy 2:19. A sermon on Acts 24:25. A sermon on Proverbs 3:17. A sermon on Proverbs 3:31-32. Two sermons on Proverbs 10:20. A sermon on Acts 10:34-35. A sermon on Mark 4:24. A sermon on Hebrews 2:11. A sermon on Hebrews 13:5. A sermon on 1 Thessalonians 5:8. A sermon on Proverbs 14:14. A sermon on John 1:29. A sermon on John 18:11. A sermon on Luke 23:34. A sermon on John 19:30. A sermon on Ecclesiastes 7:29. A sermon on Ecclesiastes 12:7. Two sermons on Revelation 1:5-6. Two sermons on Leviticus 19:17. Two sermons on 1 Corinthians 15:19. A sermon on Romans 2:7. A sermon on 2 Corinthians 13:14. Thirty-two sermons on Ephesians 5:1-27. Seventeen sermons on Philippians 3:7-21. Two sermons on Philippians 1:21. Sixteen sermons on 2 Thessalonians 1. A sermon on Matthew 22:14. A sermon on Mark 7:37. A sermon on 2 Corinthians 4:17. Six sermons on 1 John 2:12-14. Twenty-five sermons on 1 John 3. Seven sermons on Acts 2:37-38. Four sermons on 1 Peter 1:23. Six sermons on Psalm 19:13. Five sermons on Psalm 131. Two sermons on Ezekiel 18:23. A sermon on Jeremiah 45:5. A sermon on Proverbs 6:6-8. A sermon on Proverbs 3:18. A sermon on Psalm 91:1. A sermon on John 19:34-37. A sermon on Matthew 19:30. A sermon on 1 John 1:7. A sermon on Job 10:2. A sermon on Acts 7:55-56. A sermon on 2 Samuel 24:24. A sermon on Hebrews 12:24. A Sermon Preached upon the Death of Dr. Manton.